It’s a well-established fact that the eurozone as a monetary union is a weird animal. Among the main reasons that surely stands out is its one-size-fits-all monetary policy that does not fail to be continually targeted by criticism from economists, politicians and other stakeholders in the various member countries. Without prejudice to the objective of price stability, the ECB can also support the general economic policies of the euro area including those aimed at pursuing full employment and balanced GDP growth. Put simply, the euro system can contribute to the achievement of other objectives but price stability must be its first and foremost concern. Such exclusivity of mission is rooted in the ideological attachment to the low inflation favored (obsessively) by the Bundesbank, of which the ECB represents de facto the twenty-first century heir. Yet, having an inflation target for the eurozone as a whole is equivalent to saying that such a target has to be pursued on average across member countries, thus admitting more or less significant inflation differentials between these countries despite their common belonging to the monetary union. And – as it is well-known – inflation differentials matter especially when they cannot be rebalanced by exchange rate adjustments. We had a taste of this in the early 2000s when Germany hit all records as top low inflation country in the euro area and cashed in on the related competitive advantage. This has generously rewarded Germany’s vocation to pursuing mercantilism – a policy also supported by the vendor financing strategy wisely implemented by its domestic banks. A look at BIS data (see below) on the Real Effective Exchange Rates (REER) helps to capture the competitiveness gaps induced by inflation differentials before the onset of the crisis. 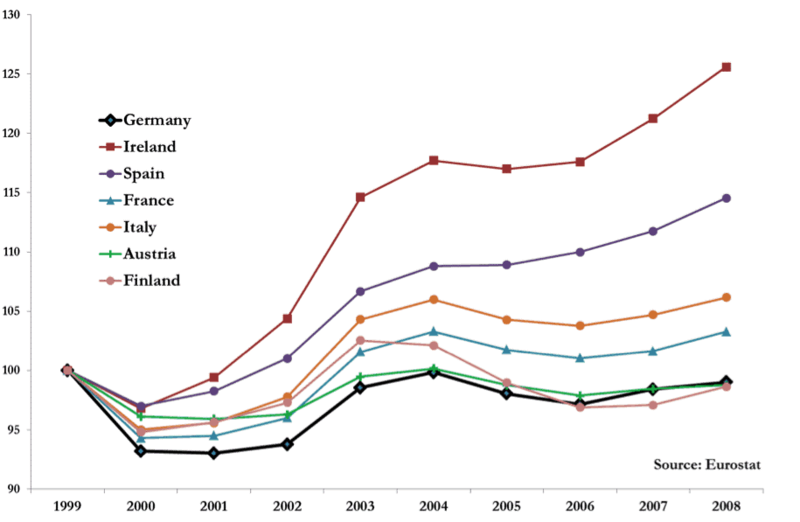 Figure 1 reports the REER for selected eurozone countries over the period 1999-2008 showing that – apart from a somehow correlated pattern (especially up to 2004) – a deterioration in competitiveness occurred in those years for most countries, with the noticeable exception of Germany and its allied states (Finland and Austria), which indeed enjoyed overall a depreciation of their real effective exchange rates. 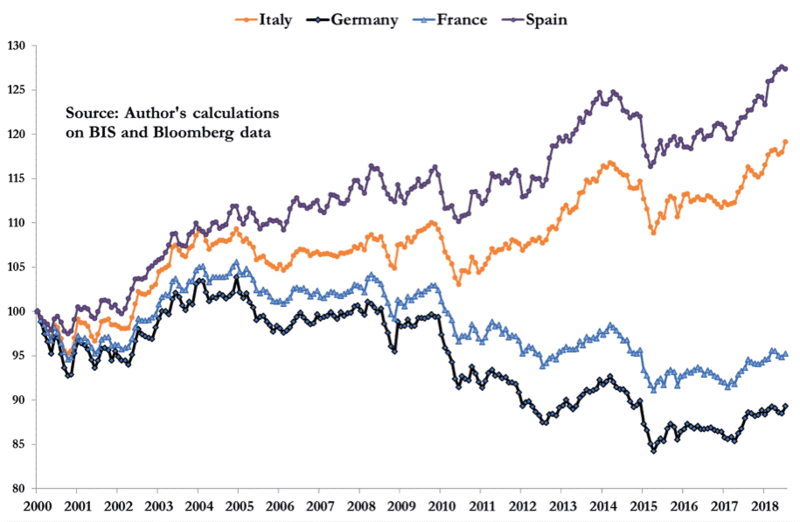 The exclusive focus of monetary policy on the inflation target for the eurozone as a whole and thus (it is worth repeating) in average terms across member countries has important implications also in terms of real interest rates. The British economist Alan Walters had predicted it when he advised Margaret Thatcher not to join the Exchange Rate Mechanism (the preparatory phase for the launch of the single European currency), highlighting the inherent instability of a fixed exchange rate system. In the absence of rebalancing mechanisms replacing bilateral exchange rate adjustments, such a system is vulnerable to large gaps between participating countries and to dynamics that amplify economic cycles at the national level. The Walters prophecy was fulfilled: before the crisis Germany was living with high real interest rates owing to low inflation, while elsewhere (e.g. Spain) rapid price growth had pushed real rates into negative territory. Consequently, investment propensity had fallen in Germany (even though this did not materially affect an economy which traditionally is more mercantilist-driven than internal demand-driven) and, conversely, low real rates have further heated high-inflation economies fueling the investment boom and the real estate bubble. The advent of the crisis progressively reversed these trends with an associated update of their pro-cyclical implications: Germany is now experiencing negative interest rates which are a valuable support for its economic growth, while in other countries (e.g. Italy) the mix of low inflation and a high real interest rates environment hinders economic recovery. In addition, further variables have intervened to feed divergences among eurozone countries; among these stand out the breakdown of the single interest rate curve for euro area sovereign issuers (meaning different costs of debt servicing for countries of the same currency area) and the anomaly of the German Bund as a safe asset of the entire monetary union. Just to take into account the combined effect of these two disaggregating factors (inflation differentials and sovereign yield spreads) on the relative competitiveness of eurozone members, I developed a new indicator – which I called Financial Real Effective Exchange Rate or F-REER – that corrects the REER by taking spreads into account. The underlying rationale is simple: sovereign yield spreads necessarily translate into different funding costs for businesses resident in the various member states, thus causing undue competitive advantages for the economy that can rely on lower interest rates. Figure 2 compares the F-REER for selected Eurozone countries showing how our monetary union has never been united and how, in terms of commercial strength, Germany is the undisputed winner. In the main currency areas, the central bank can finance government spending (so-called deficit monetization) through more or less direct interventions. Furthermore, the monetary authority typically has a dual mandate that includes – with equal validity – price stability and full employment. This produces a double influence on prices, also due to the retroactive effects of decisions impacting on wages. For these reasons, in currency areas such as the US, inflation is an endogenous risk for government bonds and it is correct to examine their yields in nominal terms: FED backing implies that for US Treasuries the insolvency risk is absolutely marginal compared to the unknown represented by future inflation. In the eurozone, however, it does not work that way. The pursuit of an average inflation target in the sense seen above and the prohibition on monetary financing paradoxically imply that the ECB’s effective capacity to control the inflationary dynamics of individual member countries is minimal; in practice, these dynamics end up responding mainly to other impulses such as the level of wages and energy prices which are in turn conditioned by idiosyncratic national factors. An important consequence of this set-up is that for eurozone government bonds inflation is an exogenous source of risk. On the other hand, the risk of outright default arises since there is no lender of last resort for national governments and still today the hallmarks of EMU governance are a strong aversion towards risk sharing and a bias in favour of fiscal orthodoxy. It follows that the comparison of sovereign yields in real terms (i.e. after adjusting for inflation differentials) allows a more correct assessment of the different insolvency risk of the various member states. A similar analysis is of particular interest for Italy, also considering that it is the only country in the euro periphery that has not benefited from targeted assistance programs from European institutions. In recent years people have got used to consider the nominal BTP-Bund spread as the main indicator of the risk of Italy (see Figure 3). Looking at this indicator, one gets the impression that the risk associated with Italy significantly reduced in the period 2015-2017 in conjunction with Quantitative Easing (QE) and then increased again, especially in recent months. But moving the analysis to the real spread, i.e. adjusted for the inflation differential between Italy and Germany, a different dynamic emerges as shown in Figure 4. Apart from a bit of volatility, the real sovereign spread for Italy today travels on very similar values to those of seven years ago. At that time, this indicator was around 350 bps on average, just 40 above the average value over the last 4 months. This suggests that Italy’s risk profile has not improved significantly over time: in practice it has been never below 150 bps since mid-2011 and permanently above 200 from the end of 2016. Nor should such evidence cause surprise since nothing has been done to reduce risks at the EU level apart from forcing ‘rogue’ countries to implement harsh internal reforms (see also here). The same QE should be counted among the non-decisive measures for increasing the eurozone’s robustness and resilience. This huge purchase program provides for a minimal risk sharing on purchased bonds (indeed each national central bank is the main buyer of the debt issued by its own government) and allocates purchases according to the capital key criterionthat has nothing to do with the inflationary conditions of the various members. Germany is the first beneficiary of bond purchases despite an almost non-existent deflation, while Greece is out of the program despite an epochal price slump. Similarly, other measures adopted by the Eurozone institutions – such as the establishment of supra-national bailout funds or the recent initiative on European Safe Bonds or Esbies – insist on rejecting risk sharing and on making any form of external support conditional upon demanding commitments from national governments. Risks remain and the anti-crisis interventions of the euro-bureaucracy have mainly played for time without confronting the real problems. The result is that today the situation appears more unstable than a few years ago given the more than doubled energy price, the biased nature of the euro-bureaucracy debate (focused more on the management of potential leavers than on risk sharing), and the forthcoming ending of QE. This unstable scenario raises centrifugal impetuses that put a strain on the robustness of the eurozone, as emerges also from electoral results of recent years in several member states. Accordingly, markets began to price the so-called redenomination risk, that is the risk that euro-denominated government bonds could be converted into the newly minted national currency of a hypothetical secessionist country. It happened last year in France during the election campaign and, in recent months, in Italy in response to the political uncertainty related to the new government coalition, with spin-overs in other peripheral countries. The main indicator of the redenomination risk is the ISDA basis that is defined as the extra premium on sovereign CDS contract under the 2014 ISDA standard with respect to the same contract under the (previous) 2003 ISDA standard. Such a basis is due to the fact that only the 2014 standard includes debt redenomination – provided that it entails a loss for bond-holders – among the events triggering a restructuring and, consequently, the protection offered by the CDS. 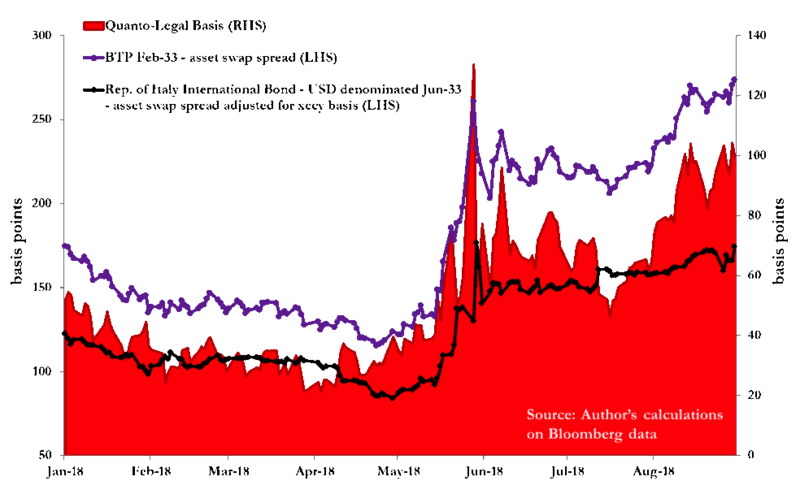 Figure 5 highlights a significant spike of the redenomination risk for Italy since mid-May. This has extended also to Spain and Portugal. 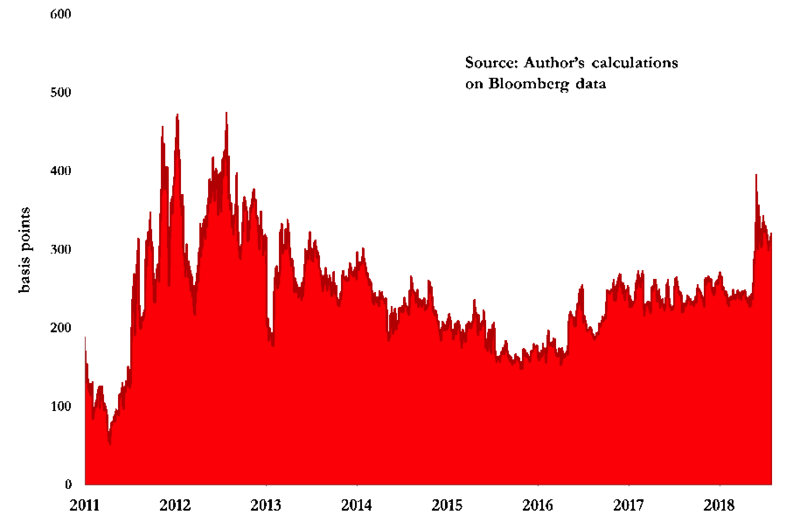 Similar dynamics are also exhibited, on a smaller scale, by the so-called CAC-basis (see Figure 6). Model-CACs (or Collective Action Clauses) were introduced in eurozone govies from January 2013 to make restructurings easier after the Greek default of March 2012. The analysis of the market of Italian govies reveals that CAC-bonds are a safer asset than their non-CAC equivalents if investors’ main concern is redenomination: indeed, given current quora, a minority of CAC-bondholders may hinder such a modification which instead remains an option available on non-CAC securities. Consistently, the CAC-basis (which measures the implied yield spread between non-CAC and CAC bonds) sharply widens in response to an enlarged perception of the redenomination outcome. A third indicator of the redenomination risk perceived by financial markets is the Quanto spread, that is the yield spread between USD-denominated and Euro-denominated bonds of the same sovereign issuer. 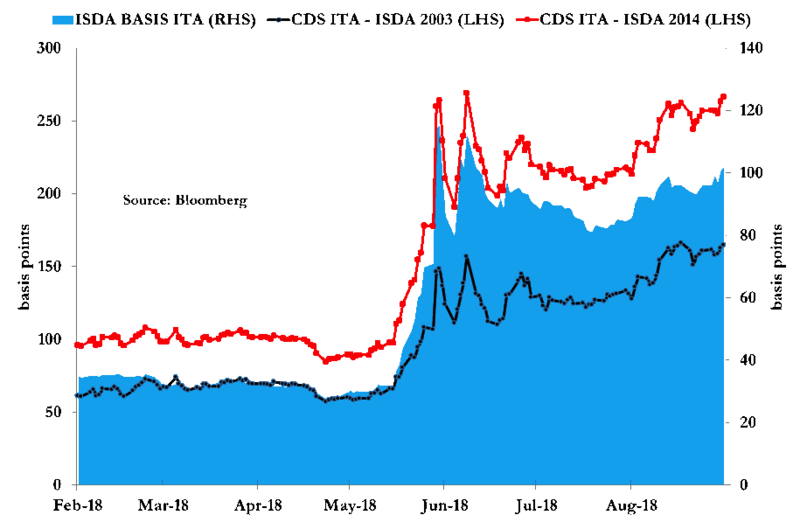 Often, the Quanto spread gets combined with the so-called Legal Basis, meant as the yield difference between local law and foreign law bonds: this basis widens in pressure times as Lex Monetae cannot be applied to foreign law bonds which consequently are protected against the redenomination risk. In order to properly compare bonds denominated in different currencies (and, thus, priced with respect to different risk-free curves) a standard metric is their asset swap spread, adjusted for the cross-currency basis. 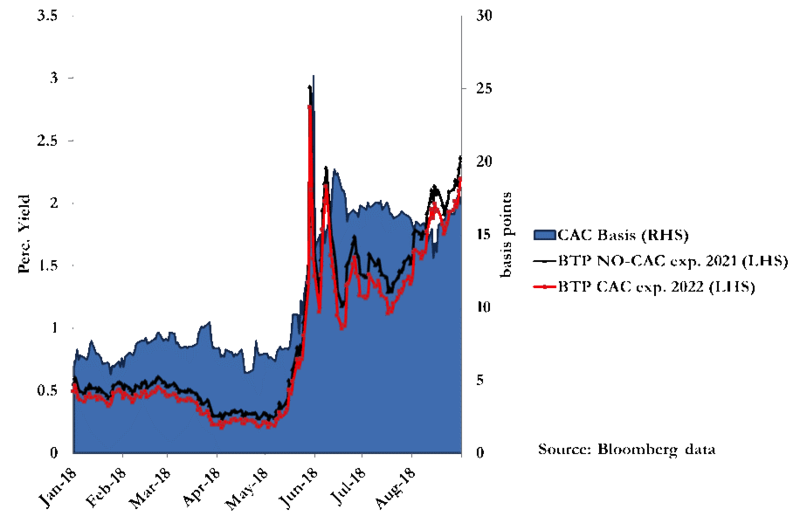 Figure 7 below displays the joint value of the Quanto Spread and of the Legal Basis for a pair of comparable Italian government bonds expiring in 2033: a euro-denominated Italian-Law BTP and a USD-denominated bond issued by the Republic of Italy under an international issuance program and subject to New York law. Clearly, over the last months the bigger uncertainty surrounding the future of Italy as a member of the euro area has pushed investors to short the first security and go long on the second. The increased market sensitivity testified by the above indicators reflects investors’ awareness of the risk segregation which characterises the European monetary union. Rather than persisting with the argument about risk reduction and fiscal discipline at the national level, it would be appropriate to take advantage of the ongoing debate on eurozone reform to move towards a genuine risk-sharing approach. Hence the importance of completing the banking union with the European deposit insurance scheme and opening to feasible proposals for the mutualisation of sovereign risks, such as the one I developed with Dosi, Roventini and Violi. This provides for an ESM supranational guarantee on public debts of all member states: such a guarantee, paid at fair market conditions and conditional upon a set of constraints to discourage moral hazard, would be a balanced solution to restore credibility to a battered periphery on which the future of the entire eurozone depends. È un fatto consolidato che l’eurozona come unione monetaria sia uno strano animale. Tra le ragioni principali quella che certamente primeggia è la sua politica monetaria uguale-per-tutti che non riesce ad evitare di essere continuamente presa di mira dagli economisti, dagli uomini politici e da altri portatori di interessi nei vari paesi membri. Senza pregiudizio verso l’obbiettivo della stabilità dei prezzi, la BCE può anche sostenere le politiche economiche generali dell’area euro, incluse quelle rivolte a perseguire la piena occupazione e una crescita equilibrata del PIL. Per dirla semplicemente, il sistema euro può contribuire alla realizzazione di altri obbiettivi ma la stabilità dei prezzi deve essere la sua prima e principale preoccupazione. Tale esclusività della missione è basata sulla adesione ideologica alla bassa inflazione favorita (in modo ossessivo) dalla Bundesbank, della quale la BCE rappresenta in sostanza l’erede nel ventunesimo secolo. Tuttavia, avere un obbiettivo di inflazione per l’eurozona nel suo complesso è equivalente a dire che tale obbiettivo deve essere in media perseguito tra tutti i paesi membri, ammettendo quindi differenziali di inflazione più o meno significativi tra questi paesi, nonostante la loro comune appartenenza all’unione monetaria. E – come ben si sa – i differenziali di inflazione sono paricolarmente importanti quando non possono essere riequilibrati da aggiustamenti nei tassi di cambio. Avemmo un assaggio di questo nei primi anni 2000, quando la Germania batté tutti i record come paese con l’inflazione più bassa nell’area euro ed incassò il connesso vantaggio comparativo. Questo ha premiato generosamente la vocazione tedesca a perseguire il mercantilismo – una politica sostenuta anche dalla strategia dell’offerta di finanziamenti saggiamente messa in atto dalle sue banche nazionali. Un’occhiata (vedi sotto) a questi dati della Banca Internazionali dei Regolamenti (BIS) sui Tassi di Cambio Reali Effettivi (REER) aiuta a comprendere i divari di competitività indotti dai differenziali di inflazione prima dell’inizio della crisi. Il Diagramma 1 mostra i tassi di cambio reali effettivi per selezionati paesi dell’eurozona nel periodo 1999 – 2008 e indica che – a parte uno schema in qualche modo in correlazione (particolarmente nella crescita verso il 2004) – in quegli anni intervenne per la maggioranza dei paesi un deterioramento nella competitività, con la notevole eccezione della Germania e dei suoi stati alleati (Finlandia  e Austria), che in effetti godettero di una deprezzamento dei loro tassi di scambio reali effettivi. La esclusiva concentrazione della politica monetaria sull’obbiettivo di inflazione per l’eurozona nel suo complesso e quindi (è il caso di ripeterlo) nei suoi termini medi tra i paesi membri, ha importanti implicazioni anche nei termini dei tassi di interesse reali. L’economista inglese Alan Walters lo aveva previsto quando consigliò Margaret Thatcher di non aderire al Meccanismo del Tasso di Cambio (la fase preparatoria prima del lancio della valuta unica europea), mettendo in evidenza l’intrinseca instabilità di un sistema di tasso di cambio fisso. In assenza di meccanismi di riequilibrio che sostituiscano aggiustamenti bilaterali del tasso di cambio, un tale sistema è vulnerabile ad ampi divari tra i paesi partecipanti e a dinamiche che amplificano i clicli economici al livello nazionale. La profezia di Walters si avverò: prima della crisi la Germania viveva con tassi di interesse reali elevati, dovuti alla bassa inflazione, mentre dovunque (ad esempio, in Spagna) la rapida crescita dei prezzi aveva spinto i tassi di interesse in territorio negativo. Di conseguenza, la propensione agli investimenti in Germania era caduta (anche se questo non influenzò materialmente un’economia che è tradizionalmente più orientata al mercantilismo che alla domanda interna) e, di converso, tassi reali bassi hanno ulteriormente surriscaldato le economie ad alta inflazione alimentando un boom degli investimenti e una bolla immobiliare. L’avvento della crisi ha progressivamente invertito queste tendenze con un connesso aggiornamento delle loro implicazioni pro-cicliche: adesso la Germania sta conoscendo tassi di interesse negativi che forniscono un sostegno apprezzabile alla sua crescita economica, mentre negli altri paesi (ad esempio, l’Italia) il mix di un contesto di bassa inflazione e di tassi di interesse reali elevati ostacola la ripresa economica. In aggiunta, altre variabili sono intervenute ad alimentare divergenze tra i paesi dell’eurozona; tra queste spicca l’esaurimento della curva del tasso di interesse unico per coloro che emettono obbligazioni sovrane nell’area euro (che comporta diversi costi del servizio del debito per paesi della stessa area valutaria) e l’anomalia del Bund tedesco come asset sicuro dell’intera unione monetaria. Solo allo scopo di mettere nel conto l’effetto combinato di questi due fattori di disaggregazione (i differenziali di inflazione e gli spread dei rendimenti sovrani) sulla comptitività relativa dei membri dell’eurozona, ho sviluppato un nuovo indicatore – che ho chiamato Tasso di Cambio Finanziario Effettivo Reale (F-REER) – che corregge il REER includendo nel conto gli spread. La logica implicita è semplice: gli spread dei rendimenti sovrani si trasferiscono necessariamente ai diversi costi di finanziamento per le imprese residenti nei vari Stati membri, provocando dunque impropri vantaggi competitivi per l’economia che può basarsi su tassi di interesse più bassi. Il Diagramma 2 confronta i F-REER per selezionati paesi dell’eurozona, che mostrano come la nostra Unione Monetaria non è mai stata unita e come, in termini di forza commerciale, la Germania abbia indiscutibilmente la meglio. Nelle principali aree valutarie, la banca centrale può finanziare spesa in deficit (la cosiddetta monetizzazione del deficit) attraverso interventi più o meno diretti. Inoltre, l’autorità monetaria ha normalmente un duplice mandato che include (con pari validità) la stabilità dei prezzi e la piena occupazione. Questo produce una doppia influenza sui prezzi, dovuta anche alle conseguenze retroattive di decisioni che hanno effetti sui salari. Per queste ragioni, in aree valutarie come gli Stati Uniti, l’inflazione è un rischio endogeno per le obbligazioni statali ed è corretto esaminare i loro rendimenti in termini nominali: il sostegno della Fed comporta che per i Dipartimenti del Tesoro degli Stati Uniti il rischio di insolvenza è assolutamente marginale a confronto con l’ignoto rappresentato dall’inflazione futura. Nell’eurozona, tuttavia, le cose non funzionano in questo modo. Paradossalmente, il perseguimento di un obbiettivo medio di inflazione nel senso visto sopra e la proibizione del finanziamento monetario implicano che la capacità effettiva di controllo delle dinamiche inflazionistiche dei paesi membri è minima; in pratica, queste dinamiche finiscono col dipendere principalmente da altri impulsi quali i livelli dei salari e i prezzi dell’energia, a loro volta condizionati da peculiari fattori nazionali. Una importante conseguenza di questo assetto è che per le obbligazioni pubbliche dell’eurozona l’inflazione è una fonte esogena di rischio. D’altra parte, il rischio di un aperto default cresce dal momento che non c’è per i governi nazionali un prestatore di ultima istanza e ancora oggi il tratto caratteristico della governance dell’Unione Monetaria Europea è una forte avversione verso la condivisione dei rischi e una inclinazione alla ortodossia della finanza pubblica. Ne consegue che il confronto dei rendimenti sovrani in termini reali (ovvero, dopo la correzione per i differenziali di inflazione) permette una definizione più corretta dei diversi rischi di insolvenza degli Stati membri. Una analisi simile è di particolare interesse per l’Italia, anche in considerazione del fatto che essa è l’unico paese nella periferia euro che non ha beneficiato di programmi di assistenza mirata da parte delle istituzioni europeee. Negli anni recenti le persone sono arrivate a considerare lo spread nominale tra BTP e Bund come il principale indicatore di rischio per l’Italia (vedi Diagramma 3). Diagramma 3 – Spread tra i rendimenti dei BTP e dei Bund decennali in termini nominali: gennaio 2011 – agosto 2018. Osservando questo indicatore, ai perviene all’impressione che il rischio associato all’Italia si sia ridotto in modo significativo nel periodo 2015-2017, in dipendenza dalla Facilitazione Quantitativa (QE), e poi si sia nuovamente accresciuto, particolarmente nei mesi recenti. Ma spostando l’analisi allo spread reale, ovvero corretto per il differenziale di inflazione tra Italia e Germania, come mostrato dal Diagramma 4, emerge una diversa dinamica. Diagramma 4 – Spread tra i rendimenti dei BTP e dei Bund decennali in termini reali: gennaio 2011 – agosto 2018. A parte di un po’ di volatilità, lo spread reale sovrano per l’Italia viaggia su valori simili a quelli di sette anni fa. A quel tempo, quell’indicatore era attorno ai 350 punti base, solo 40 sopra punti base sopra il valore medio degli ultimi 4 mesi. Questo indica che il profilo di rischio dell’Italia non è migliorato in modo significativo nel corso del tempo: in pratica esso non è mai stato sotto i 150 punti base da metà del 2011 ed è stato permanentemente sopra i 200 dalla fine del 2016. E tale testimonianza non dovrebbe suscitare sorpresa dal momento che non è mai stato fatto niente per ridurre i rischi al livello dell’UE, eccetto spingere i paesi “canaglia” a mettere in atto brusche riforme interne (vedi anche in questa connessione, testo inglese). La stessa Facilitazione Quantitativa dovrebbe essere considerata tra le misure non decisive per aumentare la solidità e l’elasticità dell’eurozona. Questo vasto programma di acquisti fornisce una minima condivisione del rischio sulle obbligazioni acquistate (in effetti, ciascuna banca centrale nazionale è il principale acquirente del debito emesso dal suo stesso Governo) ed alloca gli acquisti secondo il criterio fondamentale del capitale, che non ha niente a che fare con le condizioni inflazionistiche dei suoi vari membri. La Germania è la prima beneficiaria degli acquisti delle obbligazioni nonostante una deflazione quasi inesistente, mentre la Grecia è fuori dal programma nonostante un crollo dei prezzi epocale. In modo simile, altre misure adottate dalle istituzioni dell’eurozona – come aver stabilito finanziamenti di salvataggio o la recente iniziativa sui Bond Sicuri europei o Esbies – insistono nel respingere la condivisione del rischio e nel realizzare qualsiasi forma di sostegno esterno condizionandola sulla richiesta di impegni ai Governi nazionali. I rischi restano e gli interventi anticrisi della burocrazia europea hanno principalmente guadagnato tempo, senza affrontare i problemi veri. Nessun proposito di condivisione e di ridenominazione del rischio. Questo scenario instabile solleva impulsi centrifughi che provocano tensioni alla solidità dell’eurozona, come emerge anche dai risultati elettorali degli anni recenti in vari Stati membri. Di conseguenza, i mercati hanno cominciato a valutare il cosiddetto rischio di ridenominazione, ovvero il rischio che le obbligazioni statali denominate in euro potrebbero essere convertite nel nuovo conio di valute nazionali di un ipotetico paese secessionista. È accaduto l’anno passato in Francia durante la campagna elettorale e, nei mesi recenti, in Italia, in risposta alll’incertezza politica connessa con il nuovo Governo, con episodi in altri paesi periferici. Il principale indicatore del rischio di ridenominazione è la base ISDA che è definita come il premio aggiuntivo su un contratto sovrano di credit default swaps sulla base del valore standard ISDA 2014 in relazione allo stesso contratto sulla base del precedente valore standard ISDA 2003. Tale base è dovuta al fatto che soltanto il valore standard 2014 include la ridenominazione del debito tra gli eventi che innescano una ristrutturazione – ammesso che essa comporti una perdita per i possessori di bond – e conseguentemente la protezione offerta dai contratti di default. Il Diagramma 5 illustra una significativa crescita del rischio di ridenominazione per l’Italia a partire dalla metà di maggio. Il fenomeno si è esteso anche alla Spagna e al Portogallo. 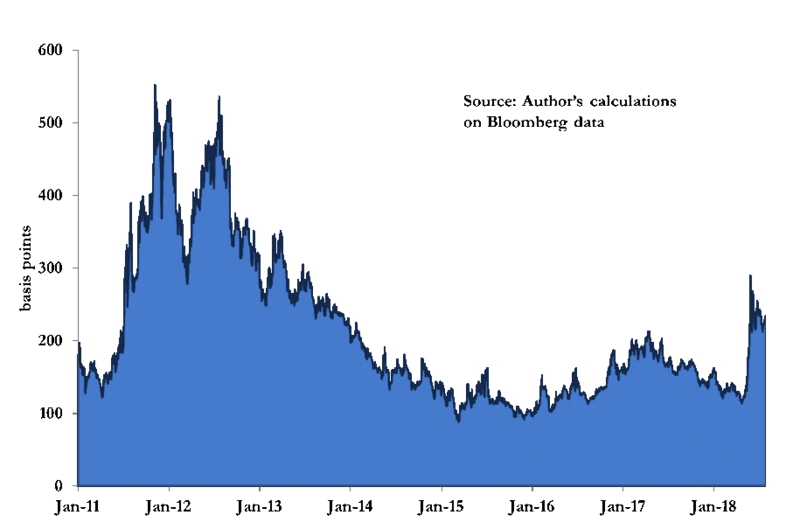 Diagramma 5 – CDS ISDA 2014, CDS Isda 2003 e base ISDA per l’Italia. Tali dinamiche sono anche mostrate, su scala minore, dalla cosiddetta base Cac (vedi Diagramma 6). Il Modello-CAC (Clausole di Azione Collettiva) fu introdotto nei bond statali dell’eurozona da gennaio del 2013, allo scopo di rendere le ristrutturazioni più facili dopo il default greco del marzo 2012. L’analisi del mercato italiano dei bond statali rivela che i bond CAC sono più sicuri degli equivalenti non-CAC se la preoccupazione principale degli investitori è la ridenominazione: in effetti, dati i minimi legali nelle attuali assemble, i possessori di CAC possono ostacolare tale modifica, che resta invece una opzione disponibile per i titoli non-CAC. Di conseguenza, la base-CAC (che misura l’implicito spread dei rendimenti tra bond non-CAC e bond CAC) si amplia bruscamente in risposta ad una percezione diffusa della percezione dell’imminenza di una ridenominazione. Un terzo indicatore del rischio di ridenominazione percepito dai mercati finanziari è il Quanto spread, ovvero lo spread dei rendimenti tra bond denominati in dollari statunitensi e in euro da parte degli stessi emittenti sovrani. Spesso, il Quanto Spread viene combinato con l cosiddetta Base legale, considerata come la diversità nei rendimenti tra i bond della legislazione locale e quelli della legislazione straniera: questa base si allarga in periodi di turbolenza in quanto la Lex Monetae non può essere applicata ai bond con legislazione straniera, che di conseguenza sono protetti contro il rischio di ridenominazione. Allo scopo di confrontare appropriatamente i bond denominati in diverse valute (e, quindi, i cui prezzi sono fissati in relazione a diverse curve di rischio), una misura standard sono gli spread sugli scambi di asset, corretti sulla base del passaggio tra le valute. Il Diagramma 7 mostra il valore congiunto del Quanto Spread e di Legal Basis per un paio di bond statali italiani confrontabili che andranno in scadenza nel 2033: un Buono del Tesoro Poliennale della legislazione italiana denominato in euro e uno emesso dalla Repubblica Italiana denominato in dollari statunitensi sulla base di un programma internazionale di emissione soggetto alla legislazione di New York. Chiaramente, la maggiore incertezza che nel corso degli ultimi mesi ha riguardato il futuro dell’Italia come membro dell’area euro ha spinto gli investitori a mettere in vendita il primo ed a acquistare il secondo. Diagramma 7 – Quanto Spread e Base legale per un paio di bond del Governo Italiano che vanno in scadenza nel 2033. La accresciuta sensibilità del mercato testimoniata dagli indicatori di cui sopra riflette la consapevolezza della suddivisione del rischio che caratterizza l’unione monetaria europea. Anziché insistere sull’argomento sulla riduzione del rischio e sulla disciplina della finanza pubblica a livello nazionale, sarebbe corretto approfittare del perdurante dibattito sulla riforma dell’eurozona per muoversi nella direzione di un approccio di effettiva partecipazione al rischio. Da qua l’importanza di un completamento dell’unione bancaria con lo schema di assicurazione europea dei depositi e aprendosi a proposte fattibili per la mutualizzazione dei rischi sovrani, come quella che ho sviluppato assieme a Dosi, Roventini e Violi. Essa tiene conto di una garanzia sovranazionale del Sistema Monetario Europeo sui debiti pubblici di tutti gli Stati membri: una tale garanzia, pagata a giuste condizioni di mercato e sottoposta a un complesso di limitazioni per scoraggiare l’azzardo morale, sarebbe una soluzione equilibrata per restituire credibilità a una periferia maltrattata dalla quale dipende il futuro di tutta l’eurozona. Ma dal diagramma sembrerebbe che l’eccezione sia stata l’Irlanda, non la Finlandia. Ovvero il rischio di dover rivalutare le obbligazioni sul debito sulla base della sostituzione dell’euro con una nuova valuta nazionale. Una ridenominazione fu il complesso processo che fu necessario allorché vennero abolite le valute nazionali per un certo numero di paesi e sostituito l’ammontare del debito sulla base dell’euro.